SGT = Sun all day. 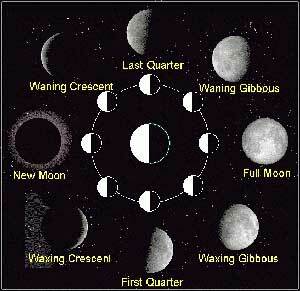 Here is a general guide to the main moon phases as it affects your energy levels for rituals or magick. However, it depends on what you are trying to achieve, while you may have less energy during a waning moon it is best for clearing and cleansing, it is a matter of going with the flow. New Moon: As the name suggests its about new beginnings with the hope and optimism that goes with a fresh start. Waxing Moon: The moon is building and with it growing strength, creativity and learning towards accomplishing a positive transformation. Full Moon: This is a time of abundance, harvesting achievements, manifesting desires and wish fulfilment it also offers psychic protection. Waning Moon: The moon is on the wane so it is a time of letting go, and cleansing, it is also a good time to de-clutter and break old patterns of behaviour. Dark or Balsamic Moon: The darkness of the waning crescent is a good time to get in touch with your mystic side, to let things die away, rest and be at peace. The best way to find out how your energy levels, mystic abilities or moods are affected by the moon is to keep a diary during the course of a lunar month over time. Then compare this with the lunar cycles to find the best times to undertake any task or course of action.